A large statue of a mermaid can be found in Guildgate district. With no inscription decorating its base and no certificate of origin stored in the city records, the statue remains a blank canvas upon which locals and visitors alike have painted their own picture. Its known commonly as the Brine Maiden, the Leggy Lass, the Salty Serenader, the Stone Seductress or Selkie of West Skerry. Legends surrounding its origins are numerous but archaeological studies indicate that it pre-dates any structure in Anvil, suggesting that the city was possibly built around her. 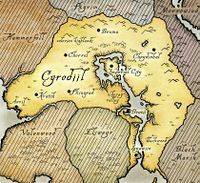 Having declared itself a free city following the fall of the Second Empire,[UOL 2] Anvil functioned as an important port, attracting merchants, smugglers, and raiders from all across Tamriel and as far south as Pyandonea. The Longhouse Emperor Leovic and his court visited Anvil four times during his reign, but he was disliked by the city's citizens and never returned after the infamous "Anvil Commotion" of Mid-Year 2E 569. [UOL 1] In 2E 577, Fortunata ap Dugal, leader of the Red Sails pirates, captured the city, installed herself as governor, and declared dominion over the entire Gold Coast. This put Anvil in conflict with nearby Kvatch, which remained loyal to the Empire. The city was not directly involved in the Alliance War which later raged in the Heartlands of Cyrodiil, benefiting from the rough stone wall originally built during Varen's Rebellion to protect the Gold Coast from retaliation by the Longhouse Emperors. In 2E 583, Anvil was threatened by werewolves from the nearby hills, and was subjected to a brief undead attack when zombies rose from the harbor later that year. Concurrently, many innocent citizens of Anvil also were killed as the Dark Brotherhood used the city as the epicenter of their recruitment drive. By the time of the Camoran Usurper, the city had been reduced to a collection of ramshackle huts housing criminals and refugees, and Castle Anvil was no more. The town was controlled by the Red Sabre pirates, but it was taken over and used as a base of operations by Commodore Fasil Umbranox while he attempted to break up the fleet circa 3E 286. During the battle in Anvil Bay between Umbranox and Torradan ap Dugal, the town was set alight. Dugal tried to flee, but Umbranox's battlemages caused a rocky outcropping to collapse over his ship, the Black Flag. As a reward for destroying the pirates, Umbranox was given the title of Count of Anvil, as well as the funds to build a city over the ashes of Old Anvil. He built a new Castle Anvil on the same island the Black Flag was buried under. Umbranox's descendants would rule for centuries afterwards. In 3E 335, the souls of Anvil's recently deceased became victim to Lorgren Benirus, a wealthy Imperial who sought to prolong his own life by becoming a lich and destroying the city. A mob led by the local Mages Guild attacked Benirus Manor before he could complete his ritual, but the manor remained cursed by the spirits of the dead and was allowed to fall into ruin. Circa 3E 422, Count Corvus Umbranox of Anvil went missing after becoming the head of the Thieves Guild and inheriting Nocturnal's curse by donning the Gray Cowl. His wife, Millona Umbranox, would rule in his stead for the next eleven years, and was beloved by her people. In 3E 433, several disasters struck Anvil. The city was briefly besieged by an Oblivion Gate to the Deadlands during the Oblivion Crisis, the city's men were targeted by a group of female thieves, and the entire crew of a ship was murdered in port by a crazed member of the Dark Brotherhood. The priestesses at the Great Chapel of Dibella were also murdered and the chapel desecrated by Aurorans under the command of Umaril the Unfeathered, who had returned to Tamriel to bring down the Nine Divines. However, the curse was also lifted from Benirus Manor, and the undead crew of the Black Flag were put to rest after the cavern of "Dunbarrow Cove" was excavated beneath Castle Anvil. Corvus Umbranox mysteriously returned to court that year and resumed his duties as count, after he used the power of an Elder Scroll to alter history and destroy the Daedric curse. During the Great War, the city was put under siege by the armies of the Aldmeri Dominion, which ended with a Dominion victory in 4E 172.